Faster Pour needle is designed to provide a quick pour from bottles with corks that are in good condition. The faster pour needle is over 20% faster than the Standard Needle. Coravin accessories are the perfect way to infuse more passion into your enjoyment of wine. 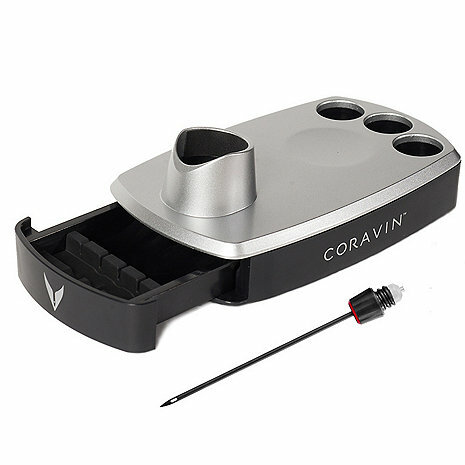 Just like a great wine pairing, the Coravin Pedestal Base + Faster Pour Needle are the perfect complement to the Coravin Wine Preservation Opener. The Coravin Wine Preservation Opener allows you to savor the glass and preserve the bottle. The Pedestal Base is the ideal place to showcase your System when not in use. It also provides a convenient home for Coravin Capsules and Coravin Needles. the Faster Pour Needle pours quickly and smoothly - so you can start enjoying your glass of wine a little sooner. Love how it holds my Coravin. And having an extra needle is great. Although it should not be so pricey.